Throughout the spring and summer, NPQ followed the made-for-opera near-implosion of the San Diego Opera, which included a dramatic exit by the board president and several other trustees, the departure of the company’s long-tenured artistic leaders, and a surprisingly successful crowdfunding campaign that generated more than $2 million in a matter of weeks. Also over the summer, we covered the wheels-coming-off saga at the Museum of Contemporary Art (MOCA) North Miami, where the museum board and the City of North Miami had a highly public feud over staff leadership, facility management, mission and ownership of the collection, all of which led to dueling lawsuits and court-ordered mediation. While both of these organizations remain works in progress—and each may prove to be a fascinating case study in its own right once the dust settles—there is progress to be reported in both instances. When we looked in on the San Diego Opera last month, a semblance of order had been restored, with new board president Carol Lazier at the helm and William Mason, former general director at the Lyric Opera of Chicago, stepping in as interim artistic director. The staff had been cut by about 10 percent, administrative and artistic staff had agreed to salary cuts to help balance the budget, the offices were being relocated to a smaller and far less expensive space, and the board had gone from 57 members to 26. According to a new report, Opera San Diego continues to focus on this, its 50th anniversary season, and on the future. Importantly, the company has renewed its commitment to the community that rallied to save it by investing in education initiatives, which had been scaled back in recent years. New director of school programs John Gabriel will develop outreach programs that are expected to involve singers, designers, costumers, wig and makeup specialists, and technical theatre artists. Already in this rebuilding year, the number of school residencies has been doubled from previous years. Additionally, San Diego Opera has retained a search firm and formed a search committee to identify new permanent artistic leadership for the company and continues planning its 2015-16 season. And the company whose former leadership saw no way forward with declining ticket sales and donations has successfully raised all but $1.2 million of the $6.5 in contributed income needed by the fiscal-year end in June 2015 to meet its reduced operating budget of $11.5 million, experienced about a 90 percent subscription renewal rate, and seen a 377 percent increase in new subscribers and a 286 percent increase in renewals from lapsed subscribers. Truly remarkable, given the dire picture that was painted by the previous board and staff leadership and the surprise vote last March (later rescinded) to cease operations at the end of the 2014 season. Our last look at MOCA North Miami in August was less encouraging, and a number of large issues still loom over the situation there. Most important is the disposition of the roughly 600 pieces of artwork that constitute the collection formerly associated with MOCA, before its board decided to disassociate itself from the City of North Miami, the city-appointed director, and the city-owned facility that had long been its home. The former MOCA board plans to open a new entity, known as the Institute of Contemporary Art (ICA) Miami, in the Moore Building in the city’s Design District, with its first exhibition timed to coincide with the internationally prominent Art Basel Miami Beach, scheduled for December 4-7. This week, ICA announced that it had hired Suzanne Weaver as its interim director, and details about the opening exhibition are expected in the next few weeks. Meanwhile, MOCA North Miami, under the leadership of city-appointed director Babacar M’Bow—whom the previous board refused to recognize and who had been leading the institution (sort of) from a remote office—has taken charge. This week the “new” MOCA, with an evolving new board and a City Council-backed steering committee aimed at generating grants, opens its first exhibition, “Third Space: Inventing the Possible,” which features the work of 18 artists, both local and international. M’Bow has plans to develop four ongoing initiatives: MOCA Contemporary Dialogues, a monthly discussion about issues in the local art scene; the MOCA Moving Image showcase, screening independent and art-house films; the Miami on My Mind series, featuring older residents from across Miami sharing their experiences; and the MOCA Curatorial Lab. When the former MOCA board announced its intention to take the collection elsewhere—initially, they had hoped to merge with the upscale Bass Museum in Miami Beach—the City of North Miami and its largely blue-collar residents feared they might lose an institution that has served as an anchor for the community for more than 30 years. 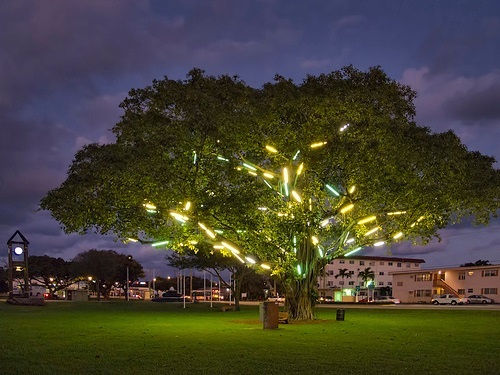 In addition to providing access to world-class art and cherished arts education programs for children and adults in North Miami, MOCA attracts visitors from far and wide, and is therefore an important source of revenue and employment for nearby small businesses.